An Exclusive Compilation of all TDS related provisions. The chart is helpful for both Professional & Academic Views & Requirements. 1. For the purpose of sections 194C, 194H, 194A, 194J & 194I, Individual/HUF should only make TDS if were covered u/s 44AB during the preceding previous year (ie., whose Gross Receipts or Turnover exceeds Rs. 100 Lacs(for Business) or Rs.25 Lacs(for Profession), during preceding previous Year). 2. 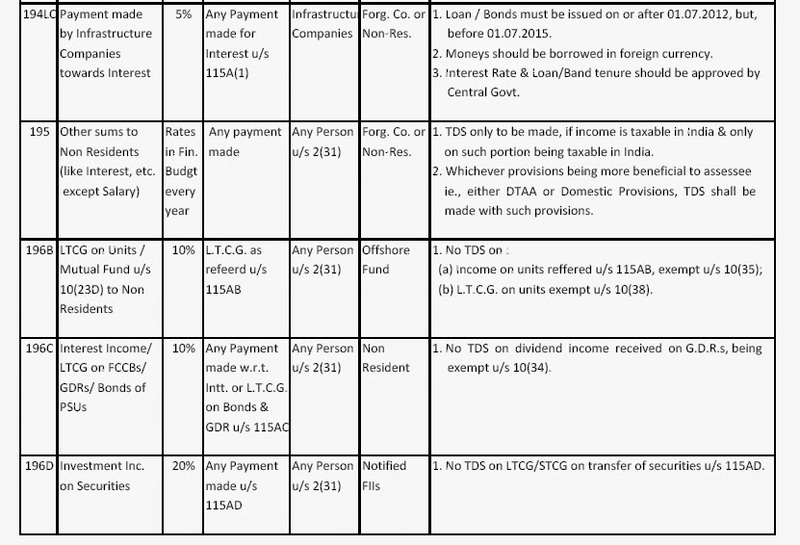 TDS shall be made on Payment or Credit whichever is earlier, in respect of the sections 193, 194A, 194C, 194D,194E, 194G, 194H, 194I, 194J, 194LB, 194LC, 195, 196B, 196C & 196D. 3. 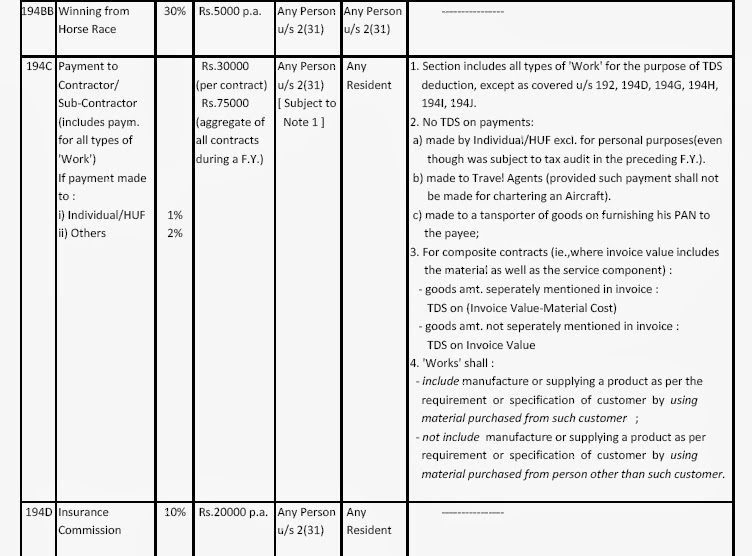 The amount which is subject to TDS liability, though being credited to any account, even under Suspense a/c willdeemed to be credited to the account of the payee. 4. 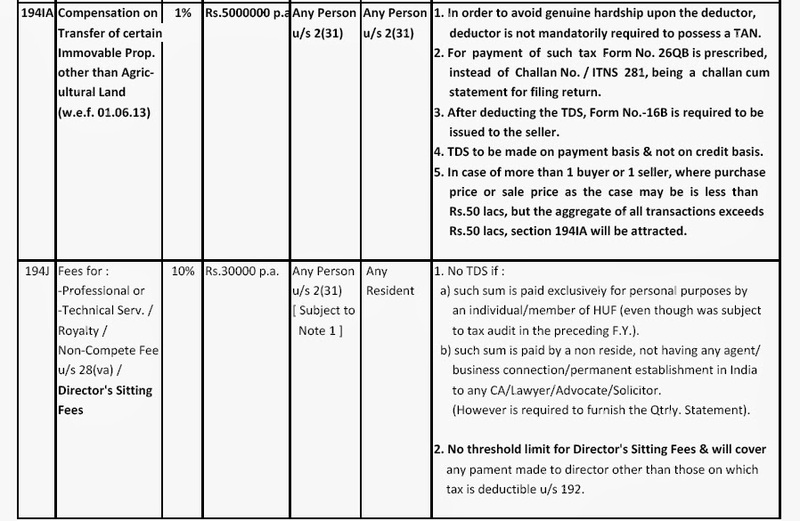 Expense will be disallowed, if TDS not made u/s 193, 194C, 194H, 194A, 194J & 194I or if made & not yet deposited,u/s 40(a)(ia). 5. 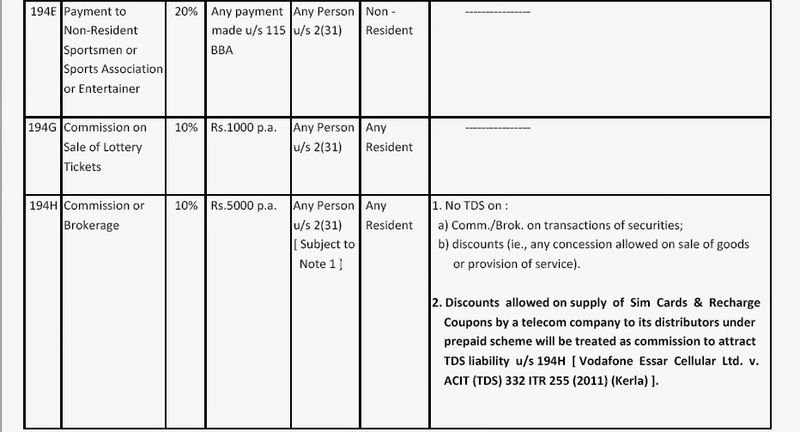 TDS u/s 192, 194A, 194G & 194H can be deposited on the quarterly basis also on the prior approval by department. 6. No Surcharge & Cess will be levied, w.e.f. 01/04/2009. However, TDS made w.r.t. payments made to non-residentwill be liable for levy of Education Cess & Secondary & Higher Education Cess. 7. 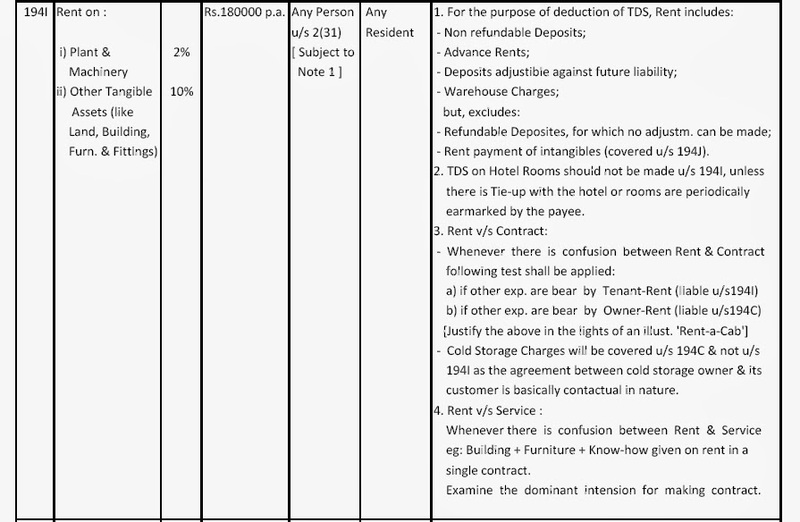 TDS will be deducted on amount inclusive of Service Tax, except in case of TDS on Rent. 8. 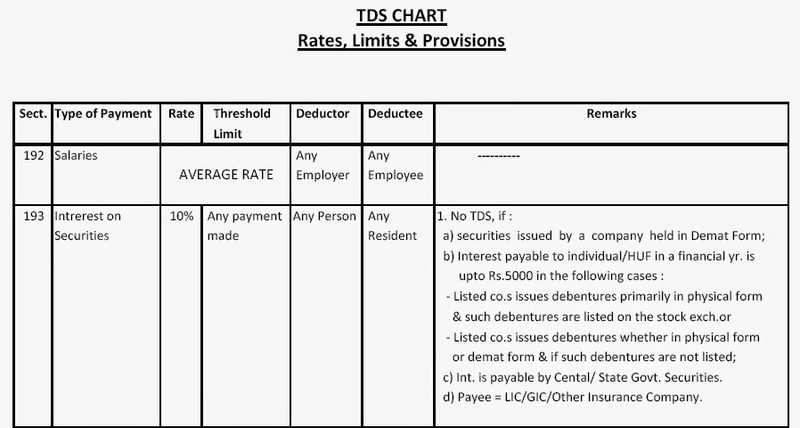 TDS Rate applicable, in case of non availiabilty of PAN is 20% or Actual Rate whichever is higher from F.Y. 2010-11u/s 206AA. - 1 % per month or part of month, on the amount of such tax, from the date on which such tax was deductible tothe date on which such tax is actually deducted. - 1.5 % per month or part of month, on the amount of such tax, from the date on which such tax is deducted tothe date on which such tax is actually paid [Sec 201(1A)]. - TDS made in March - 30th of April . 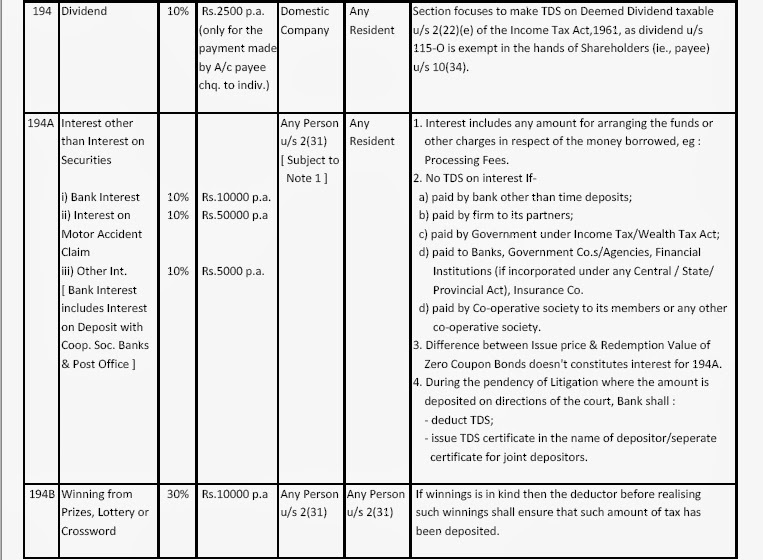 - TDS made in March - 30th September (i.e., Last Date of Filing of Income Tax Return). - For IV Quarters - 15th of May. 11. TDS certificates to be issued mandatorily, w.e.f. 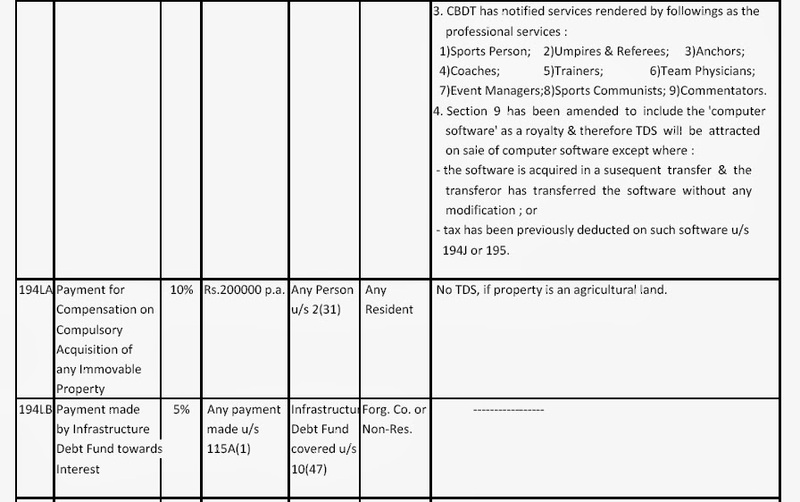 01st April, 2012 in Form 16A or 16B(for TDS u/s 194IA) generated& downloaded online through TIN Central System ( ie., from website 'www.tdscpc.gov.in' ) with a unique TDSCertificate No. (except Form 16), with the digital signatures & shall be issued quarterly within 15 days of fillingof quarterly statements u/s 203. [However, in case of Salary, Certificate to be issued upto 31st May from the end of the relevant previous year]. - Relief u/s 197 - w.r.t. all sections except 194B, 194BB, 194E, 194LB, 196B, 196C & 196D. - Relief u/s 197A - w.r.t. 193, 194 & 194A. 14. Deductor will be allowed to adjust excess TDS deposited in any quarter of a F.Y., within anyother quarter of thesame F.Y. However, if can't be adjusted during the same F.Y., payer shall be allowed refund for the same. - Deductee is a resident. 4. Corporation established under any Central act whose Income is exempt from Tax.